Roland continue their current trend of appointing new synths with names that hark back to a 'golden age' of synthesis with the SH201. But contrary to what the name might suggest, the SH201 is not a modelled digital virtualisation of the SH101 analogue monosynth. Think more along the lines of the JP8000 and you're somewhat closer — though despite many similarities with that instrument, the SH201 is more than just another repackaging exercise. For one thing, it's also Roland's first hardware synth to offer VSTi integration, and it comes with comprehensive editor/librarian software that provides easy access to hidden parameters and helps give the 201 the capability to be an integral part of a modern computer-based studio. Derived from Roland's V-Synth, the 10-voice polyphonic analogue-modelling synthesis engine is based around a two-oscillator/ oscillator mixer/ filter/amplifier structure. These synthesis building blocks are laid out left-to-right, according to signal flow, along the top part of the main panel of the synth. Below these are the modifiers — a dedicated AD (Attack-Decay) pitch envelope, filter ADSR envelope, amplifier ADSR envelope and two assignable LFOs. These ingredients are augmented by reverb, delay/chorus and overdrive effects, the now-ubiquitous, infra-red light-based D-Beam controller, an arpeggiator and a recorder section — essentially a simple sequencing tool, able to record and store eight different phrases, each up to eight measures in length. In addition, the SH201 sports an external stereo audio input, equipped with its own dedicated filter, whose signal is combined with that of the synth engine. The SH201 provides 32 preset patches and 32 user-programmable patches, each type laid out in four banks of eight. Like its Jupiter and JP predecessors, the SH201 can function monotonally or bi-tonally — ie. each preset has an upper and a lower tone, effectively two independently programmable patches within the one preset. Either the upper or lower tone can be selected, and all 10 voices used to play that one tone. Alternatively, the keyboard can be played in Dual or Split mode. In Split mode, the upper and lower tones are assigned to either side of an assignable Split point, each having five voices. In Dual mode, both Upper and Lower tones are layered across the whole keyboard, providing a total of five polyphonic voices. Note that the SH201 is bi-tonal, not bi-timbral — the distinction being that it can make two sounds at once, but receives its MIDI data on one channel only. The synth is fitted with a basic four-octave, synth-action keyboard. The keys are slightly shorter than normal (13cm) with a very light feel. Although the keyboard is velocity sensitive, many of the onboard presets have little or no velocity sensitivity, initially giving the impression that the synth itself is not velocity sensitive. This, as we'll see, is a misconception — and, indeed, it could be seen as part of the SH201's 'retro charm', evoking images of synths from the early '80s. The all-plastic construction and external power supply make the instrument very light at only 5.2Kg. The font used for the panel legending is large, bold and clear, making navigation of the controls very easy — a great help for those new to synthesis, and also to anyone using the SH201 on a darkened stage. Simplicity continues as the prevailing theme, with dedicated hardware knobs, sliders and buttons providing direct, hands-on control of parameters and functions. This is good news for the synth tyro, who may well be confounded by the intimidating LCD menus of arcane functions normally encountered at the more 'rarefied' end of the synth market. 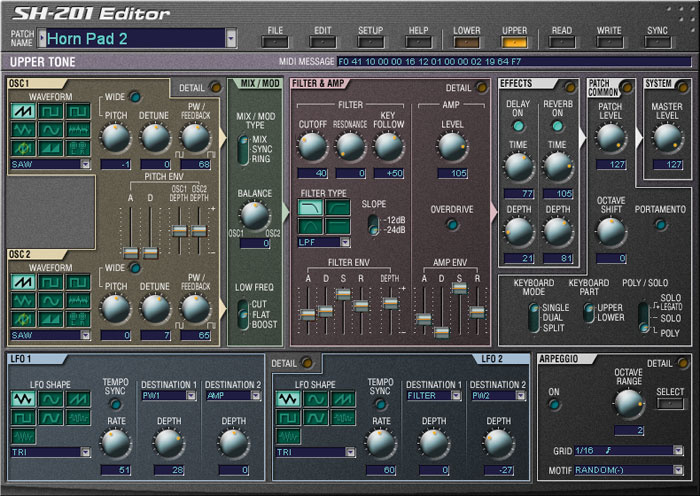 The SH201 Editor main screen closely reflects the controls found on the front panel of the hardware synth.The SH201 features many more parameters than those visible on the front panel. Although these parameters appear to be inaccessible, almost all of them (barring system settings and most arpeggiator settings) can, in fact, be accessed from the panel — as long as you know the correct combinations of buttons to press and knobs to turn. Fortunately, a complete list of button/knob combinations is reproduced in the manual, but it's a hefty list and few will have the patience to commit them to memory. However, it's worth remembering at least a few of the most frequently used ones (or carry the manual with you) so you can make critical changes while out on the road and away from your computer. The SH201 Editor program makes access to these hidden parameters a breeze. The untweakable becomes tweakable, and suddenly the SH201 belies its toy-like appearance. Amongst the 'missing' controls are velocity sensitivity (directable towards the filter and amplifier envelopes), pan, LFO fade-in times, LFO tempo sync note values, LFO key trigger and key sync on/off, portamento speeds, a full set of editable effects parameters, system settings and many more. The main Editor screen reflects the SH201 panel controls, while pressing the 'Detail' button within any parameter group reveals its in-depth parameters. Edited sounds can be written to the SH201 from within the program. Additional Librarian software is supplied to complement the Editor, and is essential for managing and particularly for archiving your sound sets, as there are no data-dumping facitilites on the SH201's front panel. Data communication with both the Editor and Librarian is possible using either standard MIDI connections or USB, the driver for which is installed from the software CD-ROM. The bright, almost toy-like appearance of the main panel is clearly deliberate — the SH201 makes as good an educational tool for the novice as it does a serious synth. However, don't be misled into thinking that the front panel represents the sum total of the SH201's capabilities — there's more to it than meets the eye, and deeper features can all be accessed via the bundled software (see the 'SH101 Editor & Librarian' box). The two oscillators are similarly specified, each having a choice of eight waveforms: sawtooth, square, variable pulse, triangle, sine, noise, feedback oscillator and Roland's 'pseudo multi-oscillator', super-sawtooth. A ninth option, 'Ext In', allows one or both oscillators to be substituted by an external audio source. Oscillator 2 has an extra pair of buttons for setting its pitch either one octave down or one fifth up, relative to Oscillator 1. These supplement the regular Pitch and Detune knobs, which can also be used to set the pitch of Oscillator 2 in the normal way. The PW/Feedback knob performs one of three functions, depending upon the waveform selected: adjustment of the width of the pulse waveform; adjustment of the harmonic content of the FB osc waveform; or the detune 'spread' of the super-sawtooth waveform. The Oscillator Mix/Mod section allows for relative level balancing of the two oscillators, as well as three oscillator mix modes: Mix, Sync and Ring. Mix passes the oscillator signals in the 'normal' way; Sync locks the pitch of Osc 1 to the duty cycle of Osc 2 (sweeping the pitch of Osc 1 produces dramatic timbral changes); and Ring modulates the pitch of one oscillator with that of the other, creating metallic and inharmonic timbres. Also here is a three-position bass filter offering flat, cut and boost settings — not unlike those found on personal stereos. The main filter has three modes — low-pass, high-pass and band-pass — offering 24dB/octave or 12dB/octave slopes, with cutoff frequency, resonance and Key Follow controls. This filter also has a bypass setting, allowing the oscillators to pass through unmodified to the amplifier. The amplifier's level control also doubles as an 'amount' control for the SH201's overdrive effect. Moving on to the modifiers, an AD pitch envelope is available to modulate the pitches of oscillators 1 and/or 2. The AD parameters are common to both oscillators, but the depth, which can be positive or negative, can be independently specified per oscillator. The two identically specified LFOs are surprisingly well-endowed; better, in fact, than those of the JP8000. Each is provided with seven waveforms: triangle, sine, sawtooth, square, trapezoidal, S&H and random. Each LFO can modulate two 'Destinations'. Destination 1 offers a choice of Osc 1 pitch, Osc 1 pulse width, filter and external audio filter. Destination 2 addresses Osc 2 pitch, Osc 2 pulse width and the amplifier. Each Destination has independent depth controls, and the LFO rates can be set manually or sync'd to the host DAW tempo (via USB or MIDI). When PW is selected as a Destination, either the PW waveform's pulse width, the harmonic content of the feedback oscillator or the detune spread of the super-sawtooth waveform will be modulated, according to which is currently selected. The final group of modifiers are an ADSR filter envelope (with plus and minus modulation depth) and an ADSR amplifier envelope. Notably, there are no visible controls relating to key velocity for either the filter or amplifier envelopes. This, of course, keeps things simpler for the novice, but I suspect it's also intentionally in deference to the Junos and Jupiters of yesteryear. Last up, the various performance controls include Roland's standard pitch/modulation lever and the D-Beam. Additional buttons provide basic controls relating to octave shift, the arpeggiator, and the phrase recorder. During the review period, I used the SH201 with Cakewalk's Sonar DAW, via the VSTi version of the 201's editor software. One issue that caused some concern was why the SH201's audio wasn't audible from within Sonar on the plug-in's appointed audio track which, in theory, it should be. A call to Roland Support revealed that because the SH201 audio driver is classed as a soundcard, it will only work if the DAW supports the use of multiple soundcards. But Sonar does indeed support multiple soundcards — and Sonar 's audio was clearly visible as activity on the plug-in's audio track meter, but wasn't passed to the main output, nor could it be recorded internally. Further experimentation revealed that if a Sonar track containing audio was routed to that track's SH201 output port, it appeared at the SH201's analogue outputs, and could be manipulated with the External Audio Filter. However, it was necessary to set the SH201 driver as the record and playback timing masters in Sonar (probably not an ideal state of affairs). 0therwise the audio played at a lower pitch than normal, with a distorted and gritty sound — indicating an incompatibility between the SH201 driver and my Mixtreme 192 soundcard. So audio does indeed travel between the SH201 and Sonar, but why it only works in the one direction remains, for now, unresolved. Roland support assured us that the VSTi aspect of the SH201 works fine in Logic. The external audio filter is dedicated to processing sounds presented to the external audio inputs. Controls are provided for input level, filter type (LP, HP, BP and Notch), slope (24dB/12dB), cutoff and resonance. In common with the SH201's other controls, any movements of the external audio filter's cutoff and resonance knobs are recordable as MIDI controller data, and reproduced on playback. Cutoff and resonance can also be assigned to the D-Beam for extra visual performance pizazz. Numerous applications for the audio filter come to mind: for example, the output from a Groovebox could be used as the external audio source. While that is playing, you could be sweeping its cutoff frequency using the D-Beam, while simultaneously playing a melody on the SH201's keyboard. Interestingly, if any oscillators are using 'Ext In' instead of a normal waveform, the external audio still passes, in stereo, through its dedicated filter — until you play a note on the keyboard. At that point, the external audio is re-routed (and summed to mono) through the synth's filter, ADSR envelopes and effects. This routing continues until all keys are released and the envelopes have finished their release cycles, at which point the external audio jumps back to its dedicated filter routing. Thus, at the press of a key, your external audio could switch from relatively 'normal' to being wildly ring modulated, given a huge ADSR filter sweep, some LFO pulsing, with reverb and overdrive for good measure. Musical? Perhaps not — but fun? Absolutely! The SH201's arpeggiator seems quite simple: each Preset has an associated arpeggio stored with it, but the arpeggio can be replaced with any of 32 preset patterns offering a selection of motifs and phrases, selectable from the front panel. That might have been an end to it — but the SH201 goes further, enabling you to create your own arpeggiating meisterwerks that can be stored along with each user preset. Beneath the hood is a fully programmable, step-based mini-sequencer that can produce monophonic and polyphonic rhythmical patterns, as well as complete polyphonic sequenced passages up to 32 steps in length. Patterns are created within the software editor, using an intuitive grid system with which each note event's length and velocity can be specified. Octave range, overall velocity response, note value grid and note-duration percentage can then be applied to the arpeggio globally. If the system clock source is set to USB or MIDI, the arpeggiator can be sync'd to host tempo. However, arpeggios can only be triggered live from the SH201's own keyboard — so to allow their incorporatation in a MIDI sequence, the arpeggio patterns are output from the SH201 as note data over MIDI/USB. That output can then be recorded into your sequencer, whereupon the opportunity arises to apply groove quantise, shift them around, or otherwise edit them. If the SH-201 could be said to have a 'signature' sound, it may be due in part to the 24dB/octave filter, which is similar in character to that of the JP8000. The overall sound is fresh, bright and typically 'Roland' — though that's not to say that it lacks warmth. Back in the analogue era of the 1980s, American synths were commonly considered 'fat', in contrast to their 'thin'-sounding Japanese counterparts. The original (and mighty) Jupiter 8 proved the exception to this rule, and I would venture to say that the SH201 carries on this tradition. Strings, pads, brass and all manner of ensemble effects come very naturally to the SH201, not least due to the super-saw waveforms that create the impression of a multi-oscillator synth from a single oscillator. The SH201 also covers lighter, more acoustically-styled sounds with ease, particularly through use of the 12dB/octave filter. The versatile modulation routings make for some very unusual textures, my favourites being the wonderfully sinuous tones produced when modulating an oscillator's feedback frequency (using the FB waveform). Fast ADSR response times ensure bags of punch when needed, the bass boost generates a fearfully floor-shaking bottom end, and the built-in effects provide additional gloss — or dirt — as required. In short, if you'd like to recreate sounds in the style of classic analogue synths from the Roland hall of fame, you should be pretty happy with what you can achieve on the SH201. As mentioned at the beginning of this review, the SH201 is the first Roland hardware synth to offer VSTi integration. 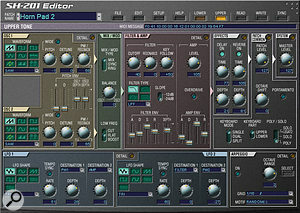 When the SH201 Editor installs, it installs as two versions: the stand-alone one (activated by manually starting the program from your computer) and the VST Instrument one (a separate DLL file). The VSTi version requires a USB connection, which provides the necessary additional 'MIDI port' to the SH201 in your DAW software. The plug-in appears in your list of VST instruments as 'SH201 Editor VST'. When loaded, the Editor appears just as if it were the GUI of a software synth. The SH201 can be edited from here just as with the stand-alone version — with the additional advantage that if you save the song with the SH201 in an edited state, it's recalled exactly as you left it when the song is reloaded. Curiously, the Editor did not support the recording and automation of its GUI elements within Sonar (my DAW of choice) in my tests during the review period (see the ' Sonar & The SH201' box. However, Sonar happily recorded changes made on the SH201's panel as MIDI control data, which is a perfectly acceptable alternative. While synths these days are generally expected to break new ground and to bristle with amazing new features, that's not always only what's needed — the continuing deluge of retro-inspired designs bears testimony to that. With the SH201, Roland are clearly negotiating a balance between innovation and ease of use, and the synth appeals on three principal levels. First, it's an excellent educational tool for the novice synthesist, with the accent on the presentation of bread-and-butter features in a clear, logical and easy-to-follow layout. Second, it appeals to anyone wishing to recapture the directness and simplicity of certain analogue synths of the early 1980s. In this case the references we are meant to note are of vintage Roland synths, but we could also stretch this point to include synths such as the Prophet 5, Korg Polysix and Oberheim OB8, which are very much in the same spiritual ballpark. Thirdly, the SH201 will suit to the experienced user in a computer-based studio, who requires detailed control over synthesis parameters, these being easily accessible via the SH201 Editor software. The SH201's external audio inputs and VSTi integration also extend functionality in significant and positive ways. On top of all that, the SH201 is great fun to play with, and has already found favour with many players as a versatile, hands-on synth for live stage use. Given all these facts, it wouldn't surprise me if the SH201 became an extremely popular little synth. Detailed editing via the included software editing program. Easily carried in one hand. VSTi integration within a host DAW. More polyphony would have been welcome. I had problems with USB audio handling when using the SH201 as a VST Instrument in Sonar. The SH201 packs loads of retro charm into a versatile, yet easy-to-use synth. From tinkly bells to blaring techno brass, lush strings and beyond, it does all you'd expect from a Roland synth. The audio inputs provide a springboard for sonic experimentation and VSTi integration comes as a welcome facility. All this, combined with effortless portability, should guarantee the SH201 many fans.